June 2018 Ted traveled to Boulder, CO for the second meeting of the NASA/JPL Data Evaluation Panel. The next Evaluation should be published in early 2019. The poster by Hanna, Yuge, and Ted was accepted for Sci-Mix at the ACS National Meeting in Boston. The poster is ENVR 642: “How not to violate the first law of thermodynamics when modeling the oxidation of atmospheric Hg(0) by OH radical". reacted rapidly with O2 in the atmosphere. February 2018 Many papers, including one by Yuge and Ted, were plagiarized in a review article on the oxidation of mercury in the atmosphere. See the post in Retraction Watch for details. The post was updated in May 2018 to indicate that the review article would NOT be retracted. December 2017 Yuge offered a job at McKinsey Consultants. Congratulations! October 2017 Yuge published his paper entitled Structures, Vibrational Frequencies, and Bond Energies of the BrHgOX and BrHgXO Species Formed in Atmospheric Mercury Depletion Events. August 2017 Graduate students Tyler Puorro and Xavier Schafer joined the research group. July 2017 LK, Weiyao, and Ted went to the International Conference on Mercury as a Global Pollutant, where LK presented a poster and Ted gave a talk. Ted also attended the Gordon Conference on Atmospheric Chemistry. May 2017 Yuge was awarded his Ph.D. and Curtis was awarded his B.S. This month also saw publication of A new mechanism for atmospheric mercury redox chemistry: implications for the global mercury budget as part of a collaboration with researchers at Harvard (Atmos. Chem. Phys. 2017 17 6353-6371. Hanna Tetu (rising junior at ESF) joined the group. March 2017 Ted visited with Florent Louis at Lille 1 University - Science et Technology. They started a collaboration on mercury chemistry. February 2017 Ted spoke at the University of New Haven. January 2017 (part 2) Yuge passed his PhD defense! January 2017 This was a busy month. Yuge's paper First kinetic study of the atmospherically important reactions BrHg• + NO2 and BrHg• + HOO was published in Phys. Chem. Chem. Phys. This same month, Hannah Horowitz at Harvard used Yuge's results to predict the global cycle of oxidation and reduction of atmospheric mercury. Weiyao Gu joined the group after finishing his MS at Syracuse University. He plans to do experiments related to atmospheric mercury chemistry. Ted spoke at the 35th Northeast Regional Meeting on Kinetics and Dynamics. LK, Weiyao, and Curtis came along. December 2016 Ted and Jiajue Chai published a review article on alkoxy radical chemistry in Volume 1 of Advances in Atmospheric Chemistry. September 2016 This month saw the publication of Abe Schwid's paper Thermodynamics limits the reactivity of BrHg• radical with volatile organic compounds in Chem. Phys. Letts. Also, Yuge submitted his most important results as a manuscript to Phys. Chem. Chem. Phys. Curtis Wilhelmsen decided to do his Senior Research on atmospheric mercury chemistry. August 2016 Khoa Lam (LK) joined the group to do calculations on atmospheric mercury chemistry. June 2016 Submitted a paper with Abe Schwid (first year undergrad!) on atmospheric chemistry of BrHg•. February 2016 Finally polished up Yuan Sha's work on tunneling in 1,5 H-shift reactions of •OOCH2CH2CH2OOH, which is the prototype for •OOQOOH in combustion. January 2016 Yuge Jiao gave another excellent talk on kinetics of BrHg• reactions with NO2 and HOO radicals at 34th Regional Meeting on Kinetics and Dynamics at Brown University. We got to catch up with Jiajue (who attended) and his family. September 2015 Yuge Jiao refined our understanding of the structures, vibrational frequencies, and energetics of BrHgY compounds in J. Phys. Chem. A. Y=NO2, HOO, ClO, BrO, and IO radicals. Summer 2015 Conference presentations on the kinetics of BrHg reactions! In Yuge Jiao gave an excellent talk on at the 2015 NorthEast Regional ACS meeting, and I gave a talk and a poster in China. In August Yuge gave a poster at the 33rd International Symposium on Free Radicals in Olympic Valley, CA. March 2015 Yuge Jiao and Feng Zhang published on reactions of peroxy radicals from methylbutanoate relevant to combustion. Some unexpected chemistry of the second-generation radicals! See it in in J. Phys. Chem. A.
August 2014 Published article in J. Phys. Chem. A on how to used mass spectrometry to detect and quantify the BrHgY compounds we had proposed in 2012. February 2014 Jiajue Chai turned in his Ph.D. dissertation and is heading off to a postdoc at Brown. Congratulations! Also, two manuscripts were submitted this month. One, submitted to the Journal of Physical Chemistry A, combines Jiajue's work on absolute rate constants here ESF with Hongyi's work determing relative rate constants at NCAR. The other manuscript, submitted to the International Journal of Chemical Kinetics is Jiajue's work on the pressure and temperature dependence of the reaction of methoxy radical with NO2. December 2013 Jiajue Chai passed the defense of his Ph.D. dissertation. Congratulations!. Also, Hongyi published her paper on Quantum Chemistry, Reaction Kinetics, and Tunneling Effects in the Reaction of Methoxy Radical with O2 in the Journal of Physical Chemistry A.
April 2013 Hongyi Hu passed the defense of her Ph.D. dissertation. She was also awarded the department's Michael M. Szwarc Award in Physical Chemistry. Congratulations!. January 2013 Yuan Sha passed the defense of her M.S. thesis. Congratulations!. December 2012 Yue Zeng graduated with her M.S. Congratulations!. August 2012 Hongyi's research highlighted at NCAR. Jiajue Chai presented a poster and Hongyi Hu presented a talk at the ACS National Meeting in Philadelphia. July 2012 Jiajue Chai passed his candidacy exam! 1) Hongyi's first paper, Temperature-Dependent Branching Ratios of Deuterated Methoxy Radicals (CH2DO•) Reacting With O2, appears in print in the A. R. Ravishankara special issue of the Jounal of Physical Chemistry A. 2) Cis–Trans Isomerization of Chemically Activated 1-Methylallyl Radical and Fate of the Resulting 2-Buten-1-peroxy Radical appears online in the Jounal of Physical Chemistry A ASAP. 3) The group's first paper on atmospheric mercury chemistry Thermodynamics of reactions of ClHg and BrHg radicals with atmospherically abundant free radicals appears in Atmospheric Chemistry and Physical Discussions. June 2012 Jiajue Chai and Hongyi Hu presented a poster. a) Hongyi's studies, carried out at NCAR, of the rate constant ratios for CH3O• and CD3O• reacting with O2 versus NO2. b) Jiajue Chai's direct determination of the rate constant for CH3O• and CD3O• reacting with NO2. March 2012 Hongyi Hu's first paper is accepted at The Journal of Physical Chemistry A! The papers is an experimental study of the Temperature-Dependent Branching Ratios of Deuterated Methoxy Radicals (CH2DO•) Reacting With O2. Ted presented two talks and two posters at the ACS Meeting in San Diego. The actual research was done by graduate students Hongyi Hu and Yuan Sha, undergraduates Matt Zelie and William Thornton, and postdoc Feng Zhang. February 2012 Dr. Feng Zhang is promoted! Former postdoc Feng Zhang is promoted to a tenure track Research Associate position at USTC. 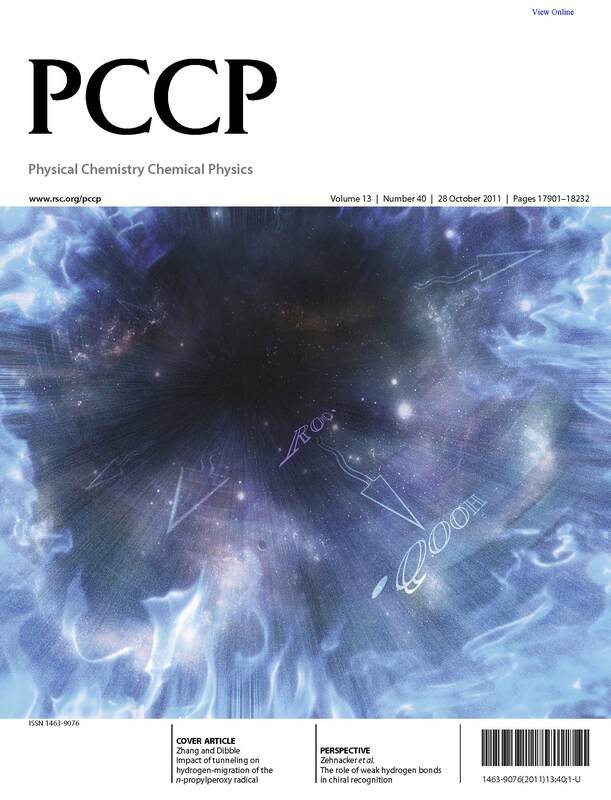 October 2011 Cover article in Physical Chemistry Chemical Physics! Article on tunneling in H-shift reactions of a prototypical peroxy radical. August 2011 Yuge Jiao joins the group as a Ph.D. student. He is interested in applying computational methods to kinetics and mechanisms of reactions in atmospheric chemistry. We will miss Dr. Feng Zhang and wish her well in her new postdoctoral position at USTC in the research group of Dr. Fei Qi. Feng Zhang and Hongyi Hu gave talks on their research at the 7th International Conference on Chemical Kinetics at MIT. Ted presented two posters at the 31st International Symposium on Free Radicals in Port Douglas, Australia. In January, Feng Zhang and Hongyi Hu gave talks on their research at the 29th Regional Kinetics and Dynamics Meeting. In March, Feng Zhang traveled to MIT to present her work to the research group of William H. Green. Later this month, she will present a talk at the 7th U.S. National Combustion Meeting in Atlanta, GA.
December 2010 Karen Schmitt passes her M.S. thesis defense! Karen presented her capstone seminar and then passed the oral defense of here M.S. thesis on Tuesday, December 14, 2010. Her thesis title is Investigating the Chemical Mechanism Initiated by Electron Beam Irradiation of VOCs in Air. Congratulations, Karen! Also this month, Hongyi Hu presented a poster at the Atmopsheric Chemical Mechanisms conference at UC-Davis and at the 2010 AGU Fall Meeting. Ted gave an invited lecture at the Chemistry Department of the University of New Hampshire this month. September 2010 Travel by Group members! Hongyi returned from 8 months spent working with Geoffrey Tyndall of the Atmospheric Chemistry Division of NCAR in Boulder, Colorado. While in Boulder, Hongyi used FTIR to determine the ratio of products of the CH2DO• + O2 reaction, which produces HCH=O (normal formaldhyde) or DCH=O. The ratio of production of these isotopologues strongly affects atmospheric HD/H2 ratios, observations of which are used to evaluate the global budget of molecular hydrogen. She also investigate the competition of alkoxy radicals reacting with O2 and NO2. Also this month, Feng visited the research group of Donald Truhlar at the University of Minnesota. Dr. Truhlar and his group graciously hosted Feng for two days to help her learn their software for computing rate constants using variational transition state theory and multidimensional tunneling. March 2010 New postdoc joins the group. Feng Zhang joins the Dibble group as a postdoctoral research associate. She holds two Ph.D. degrees: one in Physical Chemistry from Beijing Normal University, and a second in Theoretical Chemistry from the Royal Institute of Biotechnology in Sweden. She is working on desecribing the reactions of models of peroxy radicals that are responsible for ingnition of biodiesel fuel. November 2009 Research of former undergrad highlighted in Nature! Alyson Lanciki (B.S. 2006) is doing her Ph.D. research with Professor Cole-Dai at South Dakota State University. Her thesis research includes work published in Geophysical Research Letters and highlighted under "Volcano Chills" in the November 12 issue of Nature. Congratulations, Alyson! September 2009 Graduate student Karen Schmitt publishes her first paper! Karen Schmitt published her first paper, entitled Towards a Consistent Chemical Kinetic Model of Electron Beam Irradiation of Humid Air in the journal Plasma Chemistry and Plasma Processing. Congratulations, Karen! February 2009 The Dibble Mechanism! Final version of CalTech paper which first names the "Dibble Mechanism" published Atmospheric Chemistry and Physics! In 2004, Dr. Dibble published a pair of back-to back papers (see here and here) on the simultaneous double H-atom transfer reaction in alkoxy radicals from isoprene (2-methyl-1,3-butadiene). This fascinating reaction appears to be of real importance in isoprene chemistry.